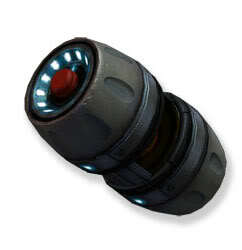 An Electromagnetic Pulse Grenade, or EMP grenade for short, is an advanced piece of anti-armour wargear. The device works by unleashing a short and powerful burst of electromagnetic radiation which plays havok with electronic equipment, like most contemporary vehicles or any form of robotics. There is some degree of variation in the effects an EMP grenade can have, generally dependent on how well shielded a target is against such an attack (though other variables may factor in). However, an EMP grenade can generally be relied on to at least temporarily disable an electronic target, if not take it down permanently. It's also worth noting that while EMP grenades tend to have no measurable affect against organic targets, those individuals with cybernetic implants or other artificial enhancements which lack advanced electromagnetic shielding are also likely to be vulnerable to the effects of an EMP grenade. EMP grenades are manufactured by several local and galaxy wide corporations and may vary widely in terms of potential power output. Some of the more prominent designs are listed below.